Vancouver’s waterfront is the place where land, city, water and people have come together for thousands of years. It’s the place we are all drawn to—to play on the water and beaches, to live near the shore, to work, to travel around, to protect and connect with nature and history. Our waterfront is under increasing pressure from urbanization, pollution, population and industrial growth as well as the effects of climate change. Parts of the shoreline—especially along the Fraser River—are changing rapidly as property values soar. And all along the waterfront, we are seeing the impact of habitat loss, fuel and untreated sewage entering the water, polluted stormwater run-off, and discharge of toxic chemicals. As a result, conflicts are increasing between different uses of the waterfront: businesses whose work depends on access to the water, residential development, public access, space for recreation and protection of the environment and cultural history. Building a waterfront for all is not solely about challenges. It presents a great opportunity. The waterfront wraps around almost the entire city, from Burrard Inlet to English Bay and along the Fraser River. As a natural connector, the shoreline has the potential to become a strong link for our community, economy and urban ecosystems. Working together as a community toward innovative solutions can lead to a return to a healthier, more sustainable place to live and work. 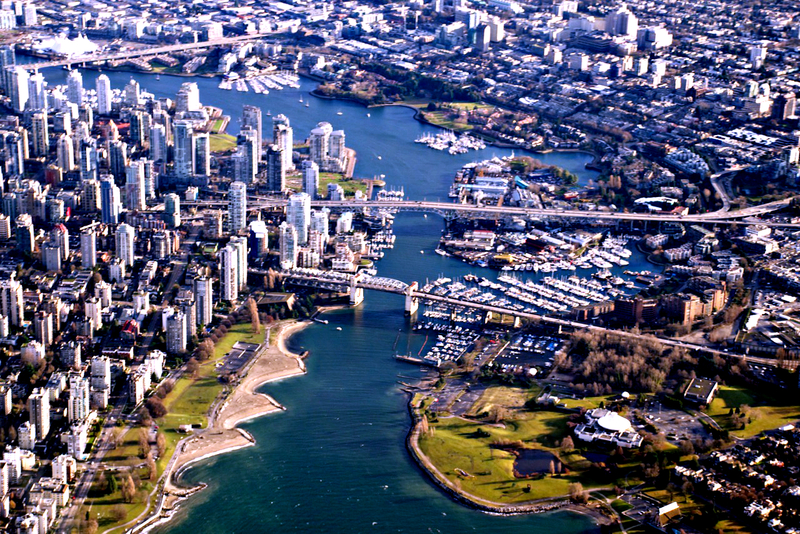 It can help us re-define Vancouver’s relationship to the ocean and river, as a prospering and sustainable “blue” city. The shores of Burrard Inlet and the Fraser River have been home to people for thousands of years. 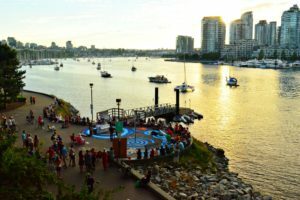 For the Musqueam, Squamish and Tsleil-Waututh Nations on whose traditional, unceded territories Vancouver was built, the waterfront continues to be of great social, economic and cultural significance. 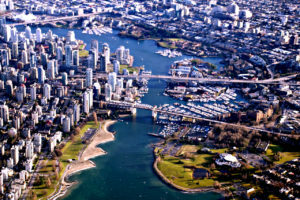 Vancouver is often rated as one of the most liveable cities in the world, and a key factor is the proximity to ocean and river. Vancouver has 17 hectares of natural shoreline—that’s equivalent to more than 100 hockey rinks. Every year, 5.5 million people visit Vancouver’s Seawall and beaches. 25,000 residents live within 300 meters of the shores. From most places in the city, it takes a half-hour bus ride or less to get to the water. There are 16 million square feet of residential space on the shoreline. 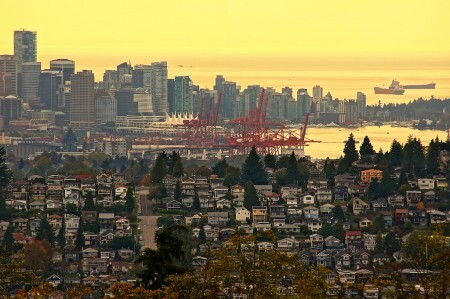 An additional 1 million people are projected to move into Metro Vancouver by 2040. A 2008 OECD report ranked Vancouver 15th out of 136 large port cities in terms of the value of assets exposed to sea level rise by 2040. 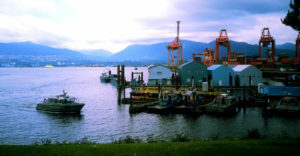 The waters and shores of Burrard Inlet, English Bay and the Fraser River have provided livelihoods and work opportunities for people since the beginnings of human settlement in the area. For those living here—First Nations and immigrants—the waterfront has always been a place to travel from place to place and to move goods around. Using our urban shorelines for sustainable transportation and industries is important for a diverse, vibrant economy and for managing our community’s environmental footprint. Transportation by boat is many times more fuel-efficient than transportation on the road. And if industries stay on the waterfront, there is less need to get people to their jobs outside of the city and truck goods back in. The waterfront also offers many opportunities for jobs in “lighter” industries, including tourism and hospitality. More than 6 million passengers use the Seabus to cross Burrard Inlet every year. Aquabus and False Creek Ferries are highly popular transportation options among locals and visitors. The float plane and helicopter airport in Coal Harbour registers over 50,000 aircraft movements every year. Over 800,000 cruise ship passengers visited Vancouver in 2013 and spent $ 121 million. Port Metro Vancouver handles approximately 135 million tonnes of cargo every year. A wide range of small and large businesses depend on the waterfront—from restaurants to cement plants and log booming grounds. ... And a Habitat We Share. Ocean and river ecosystems are an important part of the natural environment in Vancouver—and a critical part of the health of Georgia Strait. Few large cities harbour such a diversity of habitats and species, including salmon, seals, bald eagles, and even the occasional visiting whale. Their well-being and survival depends on how we manage the relationship between our city and the ocean. Yet, we have very little hard data on the health of marine and river ecosystems in our city. Vancouver’s coastal waters are home to more than 1,200 species, some of which are among the Salish Sea’s 119 species at risk. 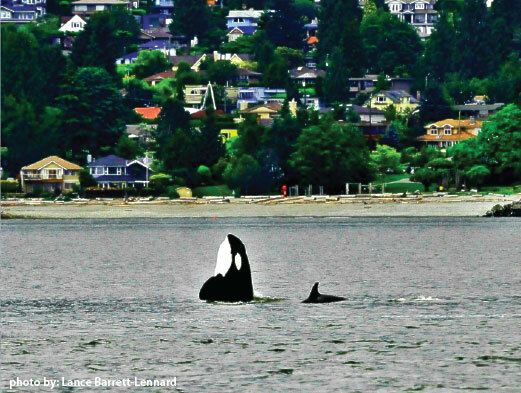 Cetaceans have been seen off Vancouver’s waterfront for five years in a row: a gray whale in 2010, killer whales in 2011, 2012, and 2013, and white sided dolphins in 2014. Burrard Inlet and English Bay are important habitats for over-wintering waterbirds, 34 species were counted in Stanley Park alone in 2014. Vancouver Harbour used to be home to biologically productive eelgrass beds, a critical habitat for so called “forage fish”, i.e. small fish that are an important food source for larger species. There are still hundreds of incidences of untreated wastewater being discharged into Burrard Inlet every year. High E.coli counts around False Creek forced the City to close beaches in 2014.